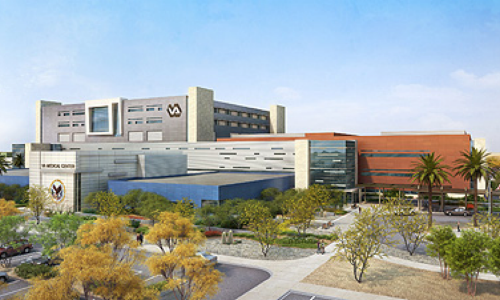 E Cube provided commissioning services on the VA Hospital Central Plant project in Las Vegas, NV. The 36,546 Sq Ft. Central Plant is equipped with Air Handling Units (AHU’s), (3) 650 HP Firetube Boilers utilizing natural gas & #2 diesel, (4) 1,200 ton chillers, cooling towers, Medical Air Compressor and Medical Vacuum Pump, Deaerator, water softeners, water filtration units and associated pumps. In addition, there are 2 pump rooms that have Industrial Water Pumps. E Cube also commissioned the 7,492 Sq Ft. Generator Building and an 881 Sq Ft. Fuel Oil Building. The Generator Building is equipped with 1,000 KW Diesel-gen sets with day tanks and remote radiators, AHU’s, associated Paralleling switchgear and automatic transfer switches. The Fuel Oil Building includes Boiler Fuel oil pumps, Generator Fuel Oil Pumps, Fuel Oil Filtration Pumps and Fuel Oil Tank Level & Leakage monitoring system.